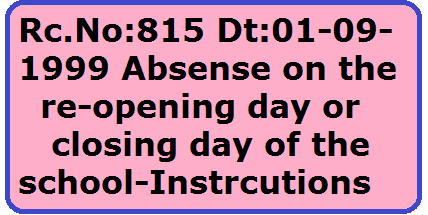 Read:- Proc.Rc.No; 10324/E4-2/69, dated 07-11-69 of the Director of Public Instructions, A,P, Hyderabad. The attention of the undermentioned Officers is invited to the references read above, wherin it has been clarified that the vacation may be combined with or taken in continuation of any kind of leave than Casual Leave. Inspite of clear instructions issued in the references, certain doubts are arised. 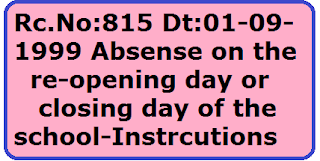 They are therefore once again clarified that as per the rules in force, if any Teacher who was present on last working day and is absent on the re-opening day of the School or was absent on last working day but is present on the re-opening day of the School, he/she may be sanctioned earned leave for the days he/she was absent , suffixing or prefixing the Summer Vacation. Similar action may also be taken in the case of terminal holidays which exceed 14 days and sanction the leave to which they are eligible duly suffixing or prefixing the terminal holidays.